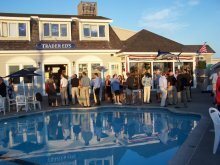 Trader Ed’s would like to invite you to plan your summer parties at the hottest place on the Water. Host a small cocktail party or a Cape Cod clambake where you and your guests can enjoy spectacular harbor sunsets by the pool. 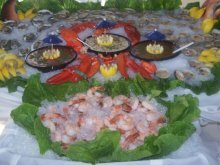 Trader Ed’s Caribbean ambiance will make your party an evening to remember. 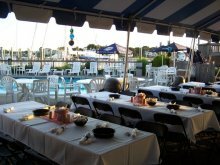 Our facilities, located at Hyannis Marina, provide flexibility and convenience with a full bar and kitchen, tent facility, Pool and raw bar all set on scenic Hyannis Harbor. 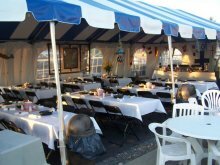 Call us to talk about your next function! 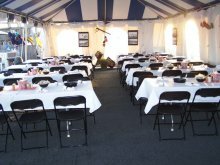 From Cape Cod Clambakes to Wedding Receptions to Corporate Functions Trader Ed’s is the Place. Scroll down to view current options and pricing. A $300.00 Deposit is required to hold any date.